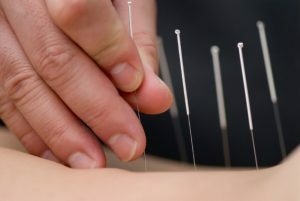 The style of acupuncture used in SB Sports and Pain Clinics is Western Medical Acupuncture. More information can be found on the British Medical Acupuncture Society’s website. Click here to see more about BMAS and the style of acupuncture we use. Western medical acupuncture is a therapeutic treatment involving the insertion of fine needles. It is an adaptation of Chinese medicine using current knowledge of anatomy and physiology, and the principles of evidence-based medicine. While this style of acupuncture has evolved from Chinese acupuncture, its practitioners no longer adhere to concepts such as Yin/Yang and circulation of qi. They use it as part of conventional medicine rather than a complete “alternative medical system”. It acts mainly by stimulating the nervous system, and results in local and central nervous system effects. Western medical acupuncture is mainly used to treat musculoskeletal pain, including trigger point (‘muscle knots’) pain. It is also effective for postoperative pain and nausea. Practitioners of Western medical acupuncture tend to pay less attention than classical acupuncturists to choosing one point over another. They generally choose classical points as the best places to stimulate the nervous system. If you would like try acupuncture but are nervous about needles please book a free acupuncture assessment in Denbigh with Sarah Bayliss.